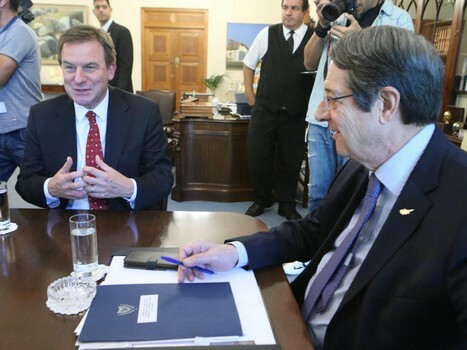 The President of the Republic, Mr Nicos Anastasiades, received today Friday, 5 October 2018, at the Presidential Palace, the Senior Vice President of ExxonMobil, Mr Neil Chapman, in the presence of the Minister of Foreign Affairs, Mr Nikos Christodoulides, the Minister of Energy, Industry, Commerce and Tourism, Mr Yiorgos Lakkotrypis and the Government Spokesman, Mr Prodromos Prodromou. After the meeting, Mr Chapman told reporters, amongst other things, that “it was a very constructive meeting. We are very pleased to be here. We took the opportunity to thank the President for his faith in us in exploring block 10. Asked if ExxonMobil will be bidding for block 7, he said that “we look at all prospects around the world and we judge them on their merits. It doesn’t matter whether it’ s block 7 or any other, we will look at them,” adding, however, that ExxonMobil has not examined any detail with regard to block 7.